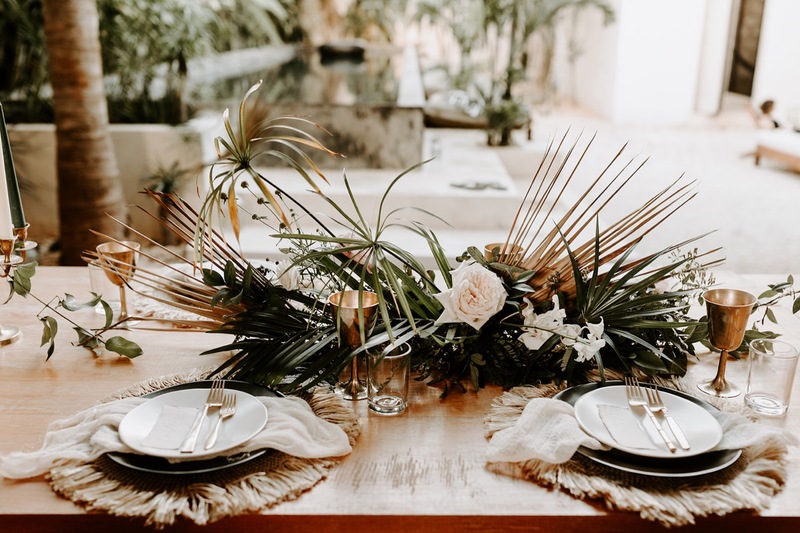 This simple, earthy, tropical inspired tablescape is one that we designed for our recent STYLEDYOU workshop in Tulum, Mexico. The indoor/outdoor dining area at 16 Tulum was one of our favorite parts of the property! Playing off of the surrounding tropical greenery, the gals from Good Seed Floral created a stunning, organic centerpiece arrangement that trailed down the entire length of the table. We wanted to keep a subtle, organic vibe for the rest of the design, so we opted for a boho, fringe charger, simple black plates and an effortless looking (but purposeful) napkin placement. Each setting was completed with a custom, hand lettered place card by Seek Paper Co.
Tequila, laughter, tacos and so much love was shared over this table that night; and if you know us, you know we love nothing more than seeing our tablescapes bring people together.